Born in 1979 in Ankara, lives and works in Istanbul. 4 how to be sure it is an artwork or not? 5 what is the relationship between the art object and me? 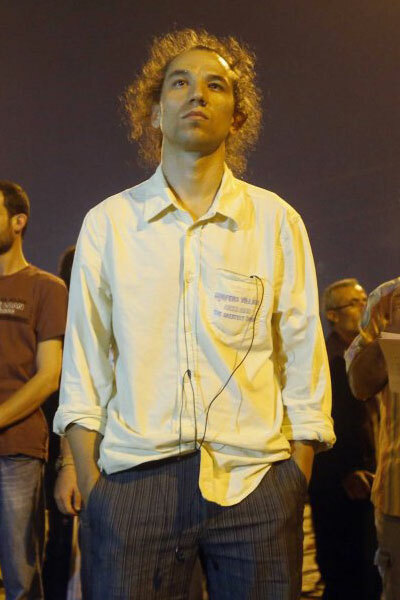 Being described as a ”legend” in the Guardian, Erdem Gündüz is a Turkish performance artist who made the headlines all over the world when he on June 18, 2013 he realized his public action "Standing Man" (in Turkish Duran Adam) during the protests in Turkey, standing on the Taksim Square for eight hours staring at the portrait of the founder of the modern Republic of Turkey, Mustafa Kemal Atatürk. Erdem Gündüz graduated with a Master of Performing Arts from Mimar Sinan University in Istanbul. Erdem Gündüz. Standing Man. Taksim Square. Istanbul. June 18 2013. © Italo Pinandello.